Lionsgate Home Entertainment kicked off the year with the Blu-ray release for Deepwater Horizon on January 10th, 2017. Matthew Sand and Matthew Michael Carnahan penned the screenplay for this action disaster film. The story is based on the 2010 Deepwater Horizon explosion and oil spill in the Gulf of Mexico. The film focuses on the dangers faced by those on board during the tragedy. On April 20, 2010, Deepwater Horizon workers for Transocean fly out to the oil rig along with executives from BP. The current test drill is behind schedule, though Engineer Mike Williams and rig supervisor Jimmy Harrell are surprised to learn that testing shortcuts are being made by BP. The two run up against BP company man Donald Vidrine, and Jimmy insists on a negative pressure test, which is inconclusive. While the drill workers continue to test the well, the results are inconsistent, but increasingly show signs of trouble. By the time the safety measures are taken, they are ineffective, leading to one of the biggest oil spill disasters in history. Deepwater Horizon is a solid disaster film that takes the audience right onto the Deepwater Horizon ring during the disaster. It is pretty clear that the goal of the film makers is authenticity, and they did a great job. Initially I found the film a little difficult to follow when the crew landed on the rig. The conversations between the workers is not dumbed down or simplified for the audience, and it can be hard to follow. Still once things start going from bad to worse, the visual representation of the events speak for themselves. While the media largely focused on the effect of the spill, men lost their lives on the rig, and the story of the rig workers is the focus of the movie. The movie is technically excellent, with extensive sets and amazing special effects throughout. The film also has a solid core, presenting the dangers faced my American workers in the oil industry. All in all I found Deepwater Horizon to be a strong film that delves into a true story of courage and determination. The cast includes Mark Wahlberg, Kurt Russell, John Malkovich, Gina Rodriguez, Dylan O’Brien, Kate Hudson, James Dumont and Brad Leland. 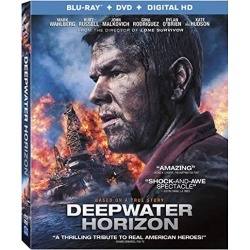 Deepwater Horizon was directed by Peter Berg, who also helmed Hancock, The Kingdom, Friday Night Lights, The Rundown, Lone Survivor, and Battleship. The film has a very strong critical reception, with a Rotten Tomatoes score of 84% and an IMDb score of 7.5/10. Deepwater Horizon went on to earn $60.9M at the US box office. The video on the disc is an AVC 1080p encode at 25 Mbps, and is presented in its original aspect ratio of 2.40:1. The contrast is strong and colour saturated throughout, though some of the night shots are less distinct. There are times when the cinematography contributes to the chaotic nature of the events to create unease in the audience. Generally though this release is technically solid and delivers what you expect from a modern movie. For full resolution PNG screen captures taken directly from the disc, check out the details page for Deepwater Horizon. The main audio Dolby Atmos object based audio, and they took full advantage of the format with this sound mix. The audio truly envelops the audience, especially as the disaster unfolds, immersing you in the scene. All in all this is a technically solid release, and it is likely a good option to go for the 4K Ultra HD version. The disc is a dual layer BD50, with 49.2 GB used and is coded for Region A. 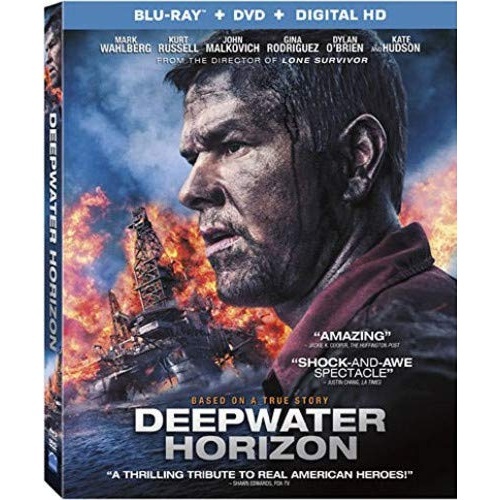 The Blu-ray release for Deepwater Horizon has over two hours of supplementary content about the film and its production. While it is nice to see such extensive coverage, some felt like they could have been more concise. This major featurette runs almost an hour, where main cast members are spotlighted in turn, with interviews from the other cast and crew. There is a separate segment each for Mark Wahlberg , Kate Hudson, Kurt Russel, Gina Rodriguez and Dylan O’Brien. The real life Mike Williams, portrayed my Wahlberg in the film, was also on board and discusses his contribution to the film with respect to its authenticity. This is a great featurette to watch in order to understand the background behind the movie and the real life events. Key cast members and director Peter Berg talk about Berg’s motivations and approach to his work on the film. Both Wahlberg and and Berg have a strong interest in real life stories at this stage in their careers. As a former actor, Berg has some understanding of how the actors feel in their position. This segment covers quite a range of crafts that contribute to the film. This extensive featurette covers the building on the set for filming on the rig. The film makers assembled a massive set that very closely resembled the real life oil rigs, complete with a functional helicopter pad. As much as was practically built, there was also extensive aspects of the rig built in the computer. Here we are presented with raw footage from the sets that show the practical elements that were used in key scenes. There are at least 12 different segments presented here, and you can select the ones you want or watch them all in one go. This segment features tributes to 8 real American workers, both men and women from fire-fighters and fishermen to electricians and loggers. Deepwater Horizon is a solid and authentic disaster film that covers the tragedy on the Deepwater Horizon oil rig. Lionsgate Home Entertainment has put together a technically excellent Blu-ray release, complete with Dolby Atmos audio and over two hours of supplements. The retail price is $39.99, though you can get it at Amazon for $19.85, saving 50%! Mark Wahlberg leads an all-star cast in this unforgettably powerful film inspired by a thrilling story of real-life heroes. For the one hundred and twenty-six people aboard the Deepwater Horizon offshore oil rig, April 20, 2010, began like any normal day. Before day’s end, the world would bear witness to one of the greatest man-made disasters in U.S. history. Deepwater Horizon reveals the brave acts of the men and women who rose to the challenge – and risked everything to lead others to safety. This entry was posted on Friday, January 27th, 2017 at 10:00 am	and is filed under Action, Atmos, Blu-ray, Commentary, Drama, Lionsgate, Thriller. You can follow any responses to this entry through the RSS 2.0 feed. You can skip to the end and leave a response. Pinging is currently not allowed.